Iranian archeologists plan to identify the food basket and diet of the people who lived in the historical site of Sialk over 7,000 years ago, Iranian Cultural Heritage News Agency reported on Friday. Located at the edge of the central desert of Iran, near "Kashan", Sialk is considered one of most important and archeologically-rich areas in Iran and experts have already discovered artifacts dating from the fifth to first millennium B.C. there. They have also found out one of the oldest ziggurats of the world in this civilization basin. 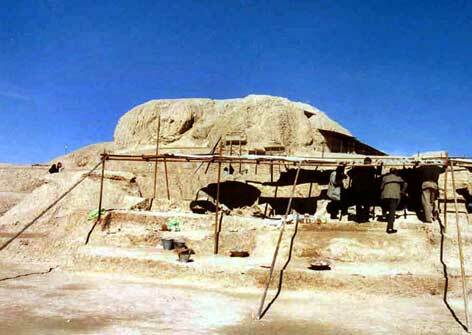 Archeologists have already concluded that residents of Sialk had red and white meat as the main source of their nutritious protein, but now they want to find out which kind of meat was prevalent in their diet, announced Sadegh Malek Shahmirzadi, discoverer of the ziggurat and head of the research team. The animal bones discovered in the area are of various farm and wild animals such as cow, ship, goat, gazelle, and ram, explained head of the archeological studies of the site, he said. The abundance of the bones of farm animals (cow, sheep and goat) in comparison to those of gazelle and ram shows that the residents consumed meat of farm animals as the main source of protein, and hunted occasionally. "We want to see if the inhabitants used cereal and corn and whether they cooked or baked or steamed them," Shahmirzadi added. The first round of excavation was carried out some 70 years ago by the great French archeologist Roman Girshman and new studies have led to the identification of the social, economical, political, and governmental systems of different historical periods. A new excavation season started in the area two years ago, giving way to important discoveries such as the oldest ziggurat of the world with three stories made of about 1.25 million mud-bricks, and some five hundred pieces of copper scraps. Experts believe that Sialk dwellers had been making all of their tools and instruments by stone, but little-by-little they had started to use metal for making their implements. The artistic taste of these people has been found through the engraving on bones which had been carried out for the first time and through the designs on their pottery".